Hurricane Matthew's rampage through North Carolina's coastal plain last month flooded more than 140 feces-strewn swine and poultry barns, more than a dozen open pits brimming with hog waste and thousands of acres of manure-saturated fields, an analysis by EWG and Waterkeeper Alliance reveals. 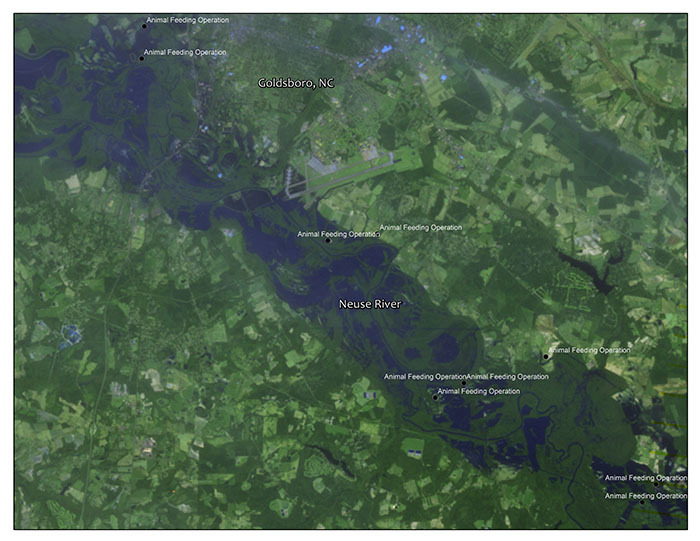 From aerial surveys and imagery, the organizations produced maps that provide the first publicly available, detailed look at the flooding’s impacts on 36 factory farms along the Neuse, Black and Cape Fear rivers. The maps are an ugly reminder of the recklessness of placing densely concentrated, confined animal feeding operations, or CAFOs, in a low-lying area deluged annually by tropical storms. As documented in our first “Exposing Fields of Filth” report, the 47 counties in the state's Atlantic coastal plain are home to 96 percent of North Carolina's hog CAFOs and more than a third of its chicken CAFOs. In Craven, Duplin, Green, Jones, Lenoir, Pitt, Sampson and Wayne counties, the flood partially submerged 10 industrial pig farms with 39 barns, 26 large chicken-raising operations with 102 barns, and 14 open-air pits holding millions of gallons of liquid hog manure. In the 47 counties in the larger coastal plain, CAFOs generate more than 9 billion gallons (96 percent of the entire state’s output) of liquid animal waste and over 193 million pounds (47 percent of the entire state’s output) of dry animal waste each year (see Figure 1 below). The wet animal waste is largely produced by swine CAFOs stored in unlined, open-pit waste lagoons then sprayed on waste application fields, lined with ditches known to release animal waste pollution into nearby waterways. Within the 100-year floodplain of the coastal counties, 62 CAFOs house more than 235,000 hogs and 30 CAFOs house over 1.8 million chickens. 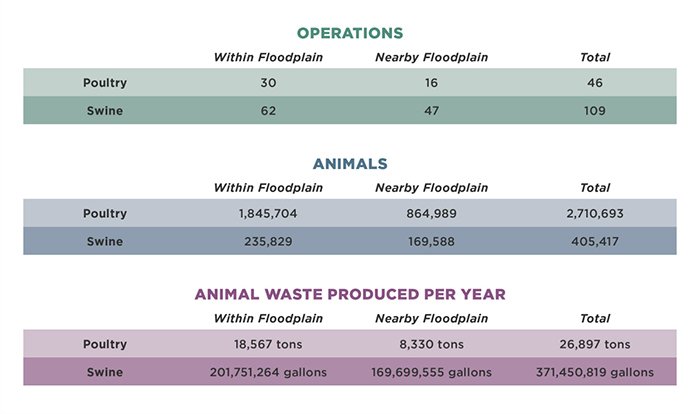 There are 166 open-air waste pits directly within the 100-year floodplain, and another 366 within 100 feet of the area (see Table 1 below). 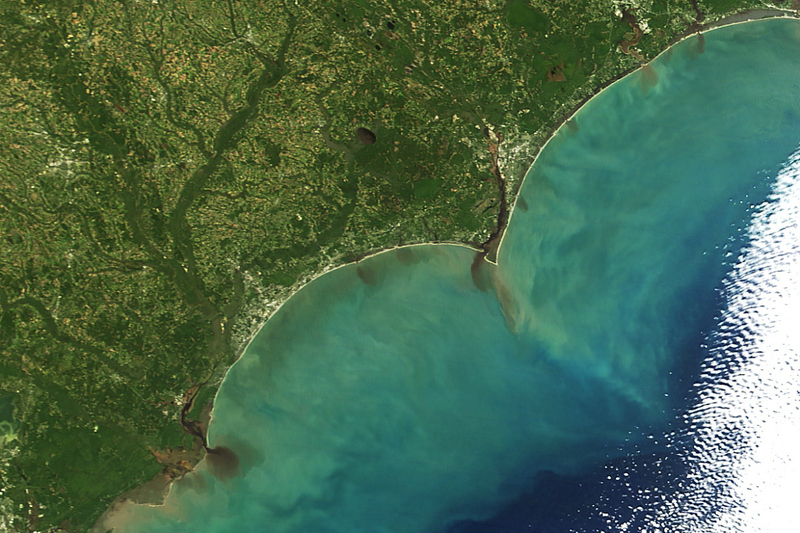 From Oct. 7 to 9, rains from Hurricane Matthew triggered flooding so massive it was visible from space (see Figure 2 below). The storm dumped more than 18 inches of rain on North Carolina's Atlantic coastal plain. Roberson, Columbus, Gates, Johnston, Bladen, Cumberland, Wayne, and Hertford counties all received more than 10 inches of precipitation on average (see Figure 3 below). When floodwaters reach livestock confinement barns, waste lagoons or waste application fields, the nearby surface water becomes contaminated with large volumes of livestock animal urine and feces, which contain a number of pollutants extremely harmful to human health and the environment. Excrement from a chicken CAFO leaks from an inundated barn, contaminating water draining into the Neuse River near Seven Springs, N.C. Photo: Waterkeeper Alliance, 2016. The contaminated water may contain human pathogens, like E. coli or salmonella, which pose a serious risk, compromising drinking water, ecosystems and recreational areas. Sampling conducted after Hurricane Floyd in 1999 found dangerous levels of E. Coli and Clostridium perfringens in water, even after floodwaters had receded. After Hurricane Floyd, the state of North Carolina and Smithfield Foods, Inc. committed to addressing this problem by closing swine CAFOs and implementing other measures to prevent pollution from facilities located in the 100-year floodplain. According to the North Carolina Department of Agriculture, the state spent $18.6 million of taxpayer money to close only a relatively small number of the most flood-vulnerable swine CAFOs – 42 facilities with 103 waste pits. 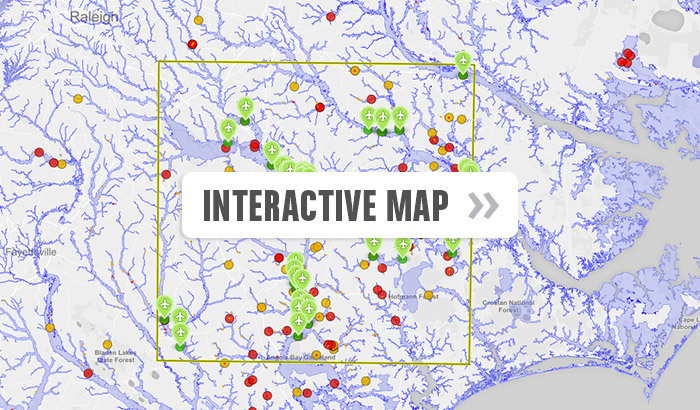 Many of the remaining swine CAFOs are concentrated in the sensitive Neuse River Basin. The state also prohibited the construction of any new swine CAFOs that used waste pits or sprayed manure onto fields. Farm fields on which swine waste is sprayed are even more susceptible to heavy rains and flooding, making these disposal sites a major source of water pollution during storms. New research by Elizabeth Christenson of the University of North Carolina has identified farmland in Duplin County on which the state allows spraying of hog manure with a manure management permit. EWG found that within Duplin County, which is home to more than 2 million pigs, 12 percent of the designated swine waste application areas are within the floodplain. Even worse, the state does not issue permits for the storage and land application of the 2 million tons of waste produced annually by poultry CAFOs. Poultry waste is applied onto fields throughout North Carolina’s coastal plain, and Waterkeeper Alliance has documented numerous instances in which enormous, uncovered piles of waste have been stored directly next to waterways. 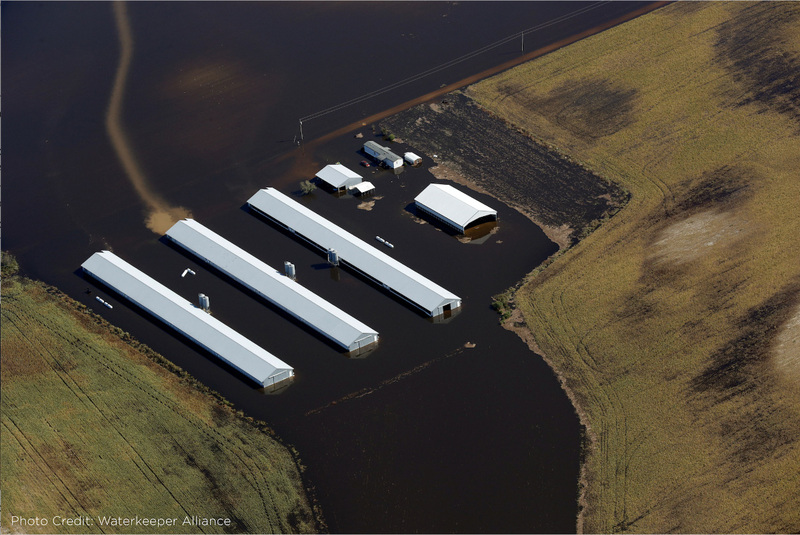 After Hurricane Matthew, which lasted from Oct. 10 to 17, Waterkeeper Alliance coordinated 20 aerial surveys to assess flooding impacts on swine and poultry CAFOs in eight North Carolina counties. Pilots flew in and around floodplains along the Neuse River, Black River, Cape Fear River, and various smaller creeks and swamps. Photos taken during the surveys documented the inundation of 10 swine operations (39 barns), 26 poultry facilities (102 barns) and 14 waste pits. 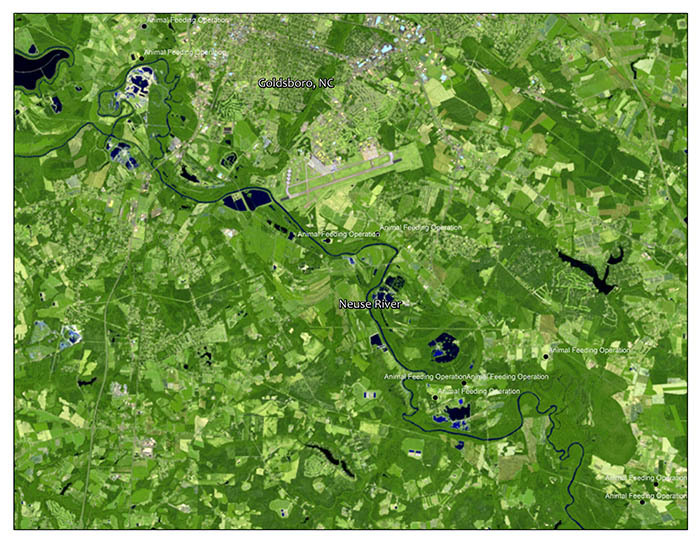 In Wayne County, near Goldsboro, flooding was evident along the Neuse River and is visible in recent satellite images. The images below, taken in September and October 2016, detail numerous CAFOs which appear to be in and around the submerged areas. The aerial surveys and data analysis document a serious problem. Millions of animals generating enormous amounts of waste in low-lying swamp areas puts public health, the environment and outdoor recreation at an unnecessary risk. The time to address the problem is now, while thousands of gallons of feces dissolve into North Carolina’s water and dead animals wash to shore. Policymakers must be bold to ensure positive change for the environment. It’s only a matter of time until the next storm inundates North Carolina’s coast, swamping factory farms and churning feces-laden waste into vital waterways, including those that are sources of drinking water for many North Carolinians. We are grateful for the assistance of Cape Fear River Watch, Crystal Coast Waterkeeper, Sound Rivers, Winyah Rivers Foundation, and White Oak-New Riverkeeper Alliance in the collection of aerial imagery that made this report possible. 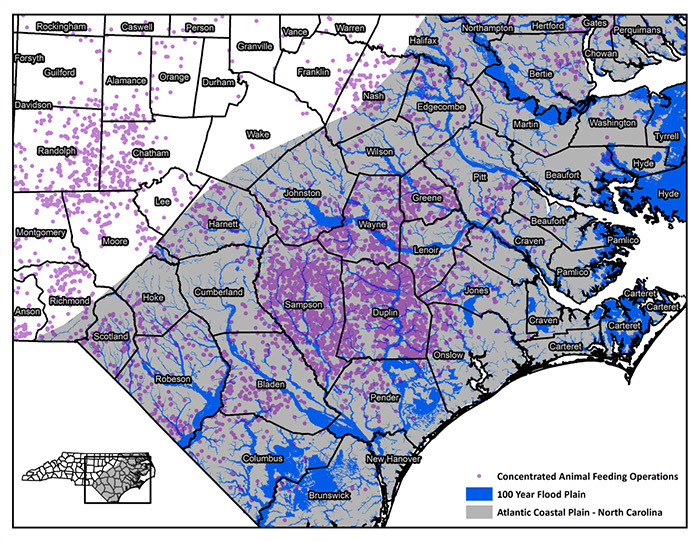 1 The 100-year floodplain is the area where there is a 1 percent of chance of flooding each year, but it is derived from a statistical average that does not preclude more frequent floods. 2 Communication from N.C. Department of Agriculture to EWG, March 2016. The money came from the North Carolina Clean Water Management Trust Fund, which receives an appropriation from the legislature to issue grants to local governments, state agencies and conservation nonprofits to address water pollution issues.